Take a bite of this butterscotch cake and escape into the world of sweet delicacy! This Butterscotch cake is a luscious treat that will drool the taste buds of anyone. It is baked by using the ingredients which are rich in quality. It's a perfect gift for the birthday of near and dear ones. 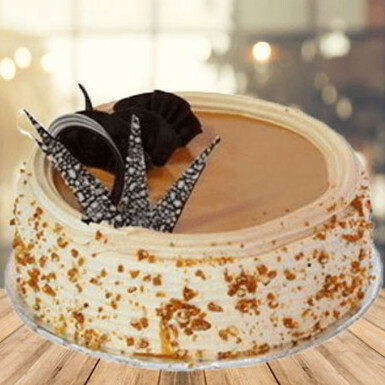 So, go ahead and order butterscotch cake online from Winni. The cake was fresh and tasty, and delivered well within the selected time slot. I am highly delighted and will definitely recommend to my family and friends. Easily one of the best cakes we have eaten in years. The cake was moist and very tasty. Caramel bits were crunchy. One more star ie. 6 star product. Late night delivery was awesome.